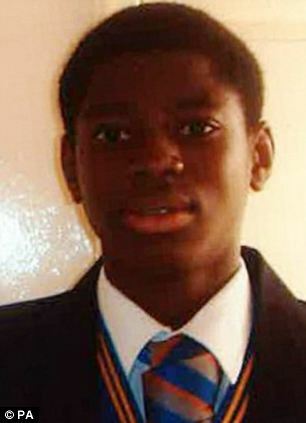 A 14-year-old girl ‘set up’ a Nigerian schoolboy to be stabbed to death by her boyfriend after a row over football. 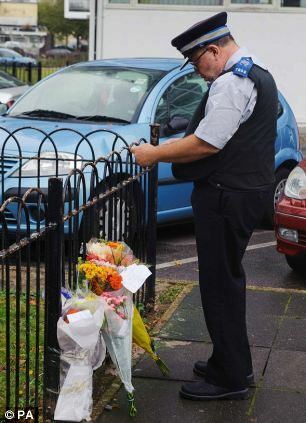 She called her 16-year-old boyfriend to a housing estate in Brixton, south London, where he killed keen footballer 15-year-old Junior Nkwelle. Junior and his friends had been playing football on a grassy area when an argument broke out. The youngster was stabbed in the chest after the older boy arrived on a bus and started fighting with him. He died on the makeshift pitch on the Loughborough estate in September, last year, after the knife cut his heart and a lung. The alleged killer girl and her boyfriend, who is now 17, deny murder. Jonathan Turner, QC, prosecuting, said it was likely Junior and his alleged killer did not know each other and there was no quarrel between them. Mr Turner said: ‘He (the defendant) had been telephoned by his girlfriend and told to come to the estate to teach Junior Nkwelle a lesson. ‘There had been an argument between her friends and Junior’s friends whilst the football was going on. ‘She thought that Junior had insulted her or been less than respectful to her. ‘She was very angry and determined that he should be punished – indeed stabbed – to put things right. Mr Turner said the children had been arguing earlier in the evening. It might have been because the boys were thought to be playing too close to flats or that the girls were walking over the pitch. ‘Whatever it was, it seems to have been stupid and trivial and completely unnecessary,’ he added. What the hell is all this grammer & rubish talk about Simply put , this is murder, & the wages for a murderer is hang to death or death by injection so whatever led him to brutally murdered a fellow human being is not important, he has commited murder. His girlfriend should’ve called him to hang himself to death & not stab an innocent teenage boy to death. He is a murderer, & don’t deserve less than death also . So sad to read this kind of disastrous event. Both of them shld face d consequence. Some people are so heartless, may his soul rest peace. What a wicked world,they deserve justice wich is death by hanging,but white men will not do that to their children,that justice is for God alone,that on judgement day. Dis hapnd since Sept. last year? Wat about d wicked brats dat did dis? Did they pull out free&dry afta dis? Dis story,tho sad, aint complete. May his gentle soul rest in peace. Both of dem should face the Law. MAY HIS SOUL RST IN PAECE . . . PLS WE SHOULD ALL REPENT AND GIVE OUR LIVES TO JESUS . . . GOD BLESS YALL . . .